When recession of the gumline occurs, the body loses a natural defense against both bacterial penetration and trauma. 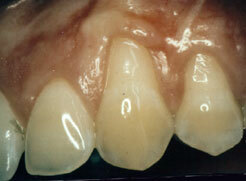 The exposed soft root surface is susceptible to decay and abrasion with progressive recession. There are treatment options we provide. If there is only minor recession, a reduced healthy gum collar may remain to protect the tooth from further bacterial penetration and recession. If so, then no treatment other than modifying home care practices is necessary. However, when recession destroys the protective gum collar, the first line of defense against bacterial penetration is lost. A gum graft is designed to solve these problems. A thin piece of tissue is taken from the roof of the mouth or gently moved over from an adjacent area to provide a stable band of attached gum around the tooth. 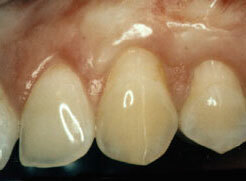 The gingival graft will be placed in such a way as to cover as much of the exposed portion of the root as possible.